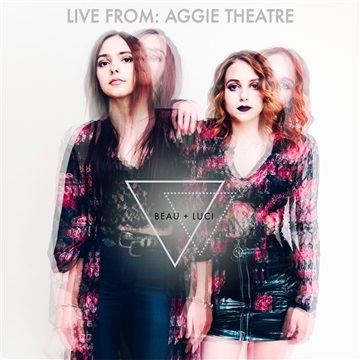 BEAU + LUCI, Sister Sirens of Swamp Rock cast their primordial spell with BEAU + LUCI LIVE From Aggie Theatre (ft. The Howling Tongues) in Fort Collins, Colorado! With an exclusive front row seat, ride along on this personal musical journey steeped in blackwater incantations and deep-rooted in spirituals resonating from the mystery and folklore of the Okefenokee Swamplands, "the land of the trembling earth." Roll across the breadbasket of America with BEAU + LUCI, mesmerized by their haunting harmonies and bluesy melodies that wrap your soul in a blanket of foggy mysticism rising up through the spellbinding shadows high into the Colorado mountains. It’s been a dream of ours to release a live record for years; as much as we love getting into the studio, there’s no feeling quite like stepping on a stage and performing for people who love your music as much as you do. We wanted to capture that excitement, energy, and overwhelming soul, then share it with as much of the world as possible, so when we geared up for a tour out west - the farthest we’d ever been from home - we knew it was time. Like so many other aspects of our musical journey, this wouldn't have been possible (or half as fun!) without the raw power and rock ’n roll bombast of Atlanta’s, The Howling Tongues. From the first run-through to the last reverberating echo before we packed up the trailer and headed home, the five of you - Nick, Brandon, Thomas, TJ, and Davey - were there with us, pushing us, encouraging us, and making us laugh more than we ever thought possible. Thank you, thank you, thank you, from the bottom of our hearts. And last but certainly not ever least, we want to thank the BEAU + LUCI Family for the incredible amount of love and encouragement coming from every corner of the world every single day! We are forever indebted to you and are so grateful that you have welcomed us into your hearts and lives.